Brains, HUH, yeah, what are they good for? 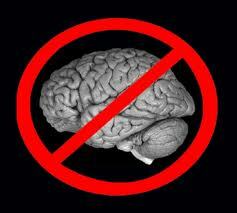 When we say "there are no mental representations", people often hear 'the brain doesn't do anything'. Because this is obviously not true, people sometimes just assume we simply cannot be talking sense about cognition and stop listening. Of course, we aren't saying this at all. Of course the brain is up to something. I've sketched out a few ideas here and here (some of which is finding it's way into a book chapter we're writing with Eric Charles), and we're working on a Research Topic at Frontiers in Human Neuroscience about how to do radical embodied cognitive science (to which any interested parties are warmly invited to contribute!). So we aren't denying that the brain is interesting and important. We just think it's doing something very different from what mainstream cognitive neuroscience thinks it is doing. Our embodied cognition (Wilson & Golonka, 2013) redefines the job description for the brain. Whatever it is that the brain is doing, it doesn't have to be representing anything (this is what the 'radical' part means). Instead, the brain is a key player in the system that interacts with information to produce behaviour, and that is a very different thing. This basic fact motivates Sabrina's proposed 'new direction for psychology' (which obviously I endorse too). Her argument is that psychologists are interested in explaining behaviour, and that the primary external cause of behaviour is the various kinds of information we are able to interact with. There are interesting contributions to behaviour made by internal factors, including the brain, but these, she argues, have their effects by modifying how and when we interact with different sources of information. Given this, psychology should get very interested in information as quickly as possible in order to really start explaining behaviour; it's paid off in spades in perception and action and there's no reason why it won't pay off everywhere else too (see Sabrina's post on language here and here, plus our handy dandy Frontiers paper). Of course the brain is a major player in cognitive systems, but in order to really know what it's up to, we have to be sure to ask it the right questions, and this means doing things in the right order. So the argument that 'the behaviour I study clearly requires internal support, and that therefore there are representations doing that work and the brain is important' is not actually an argument against doing your work from an embodied perspective. Throw away your assumptions about representations (see the section of links 'Representations & Why We Should Abandon Them' on the Rough Guide for more reasons), get serious about the information present in your task to support behaviour and only then start speculating about the form of the internal support that is required. We think you'll be surprised where you end up when representations are not the default. And please tell us what you're up to - we'd love to help if we can!